BeatMaker 3: App of the Day! 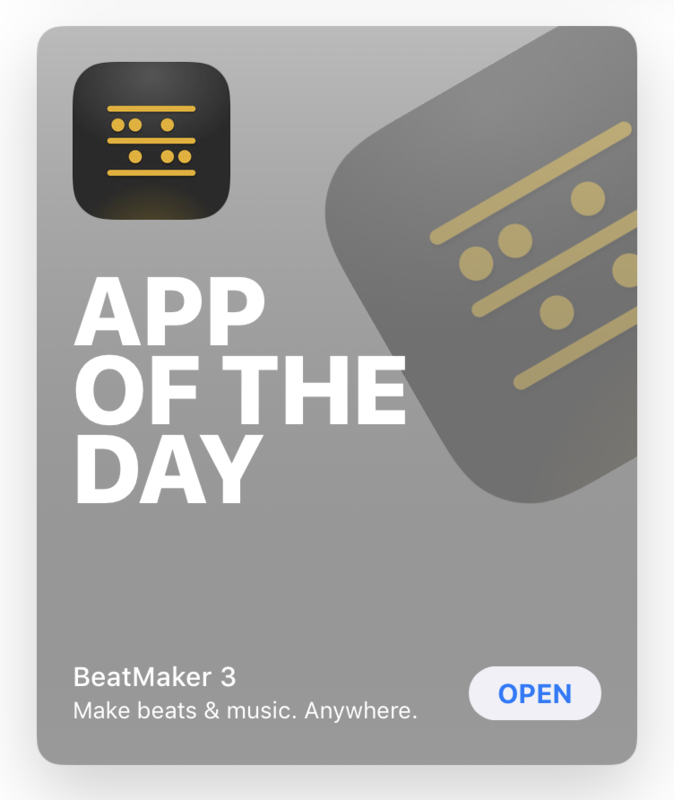 BeatMaker 3 was featured as "App of the Day" on the various App Stores on December 18th 2017. There’s a moment in most people’s lives when they seriously think about becoming a professional musician. And whether you want to become the next Dave Grohl or Danger Mouse, it used to be that you’d have to invest a small fortune just to find out if it’s something you might want to stick with. These days? Just download an app. And if we can recommend one, it would be BeatMaker 3. So what makes this app stand out from the crowd? Simply put: it’s the most complete digital audio workstation (DAW) available on the iPad. Before we start throwing out any more technical terms, let’s put it like this: you can pick up BeatMaker 3 and use it to produce a complete track from start to finish. Now, truth be told, there are plenty of apps that will technically allow you to do that, but this one goes the extra mile by providing all the tools a pro would need to work on a track and tweak it to perfection. Let’s start with samples, the building blocks you use to make music in this app. You can record and edit your own, or get both for free and paid sample packs from the store to mess around with. If you don’t want to use samples, there’s another great feature: the ability to use other music creation apps within BeatMaker 3 as plugins. So let’s say you’re happy with a particular synth or drum machine. As long as it’s compatible with iOS Inter App Audio (IAA) and/or AUv3 protocol, you can just call them up in BeatMaker 3 and use them as you would if they were standalone, but put the created music right into the sequencer. Alright, we’ll shut up. But if you want to make electronic music, BeatMaker 3 is the way to go.